Radiation Oncology is a specialized method of treating cancer using high-energy radiation in the form of x-rays, gamma rays, or charged particles (protons) to shrink tumors and kill cancer cells. Radiation may be delivered by a machine outside the body (external-beam radiation therapy), or it may come from radioactive material placed inside the body near cancer cells (internal radiation therapy, also called brachytherapy). About half of all cancer patients receive some type of radiation therapy during the course of their treatment. Radiation therapy may be prescribed alone of in addition to other treatment methods, such as chemotherapy and/or surgery. Radiation therapy is a minimally invasive and highly effective treatment. It causes only mild side effects, and provides patients new promise in their fight against cancer. Our Steps are designed to give patients every advantage in their fight against cancer. Once you and your medical oncologist have decided that beginning radiation therapy seems like an appropriate addition to your course of cancer treatments, your medical oncologist will recommend that you come in for a consultation with one of our radiation oncologists. This consultation is an opportunity for one of our doctors to meet with you and answer any questions you may have, learn about your condition, give you a physical examination, explain what to expect from your treatments, and, finally, determine if radiation therapy is right for you. It is also an opportunity for you to meet our staff and tour our facility. We provide as much time as is necessary to answer your questions in detail and help you make the right choice about radiation therapy. The next step is to develop a treatment plan. The radiation oncologist analyzes all the information and decides how much radiation is needed, how it will be given, and how many treatments you will need. A radiation oncologist, radiation therapist, medical physicist and medical dosimetrist, work together all under one roof to create a precise, personalized plan. In starting this process, you will have a CAT Scan simulation here in our department to help define the treatment areas. Corresponding areas on the skin will be marked with small tattoos. A daily treatment schedule is also created at this time. On your first day with us, you will have a simple simulation. This simulation may happen on or before your first treatment. It is where you will actually be positioned on the treatment machine. This position will be the same position you were in at the time of your Cat Scan simulation. The radiation oncologist and radiation therapist may place some marks on your skin and some images will be taken to verify the treatment plan. Because it is so important to position the angles of radiation accurately, the planning session can sometimes last up to 30 minutes. You will be positioned daily by a radiation therapist for treatment. He/she will then leave the room during the treatment, but will be able to observe and communicate with you the entire time. The machine may rotate around you as the radiation dose is delivered. Nothing will be felt during the treatment. At least once a week, you will meet with your radiation oncologist so that he/she can address any side effects or questions that you may have and make any necessary adjustments to your treatments. Our oncology nurse, is always available to you on a regular basis and you will likely get to know everyone in the Circle of Care quite well. Approximately one month after your treatments are completed, you will be scheduled to come back to the office for a consultation/evaluation with a radiation oncologist. Your radiation oncologist will continue to see you on a regular basis to monitor your condition and address any issues that may arise. Our team is always here for you! If you have questions regarding the treatment options available at Advanced Radiation Oncology, or would like to schedule a consultation with one of our Radiation Oncologists, please contact us at any time. Radiation therapy is an important component of breast cancer treatment. Since the majority of people diagnosed with breast cancer will be cured, it is critical to minimize the long‐term effects of treatment. Advanced Radiation Oncology is among a select group of centers in New York to offer prone breast radiation therapy, which is a unique approach to treating breast cancer. Prone breast radiation therapy has been found to be especially useful for patients with large breasts. The patient is treated lying face down (prone) allowing the breast to fall away from the chest, reducing radiation exposure to the heart and lungs. However, there are certain patients who may prefer the supine, or conventional, treatment positioning. It is important to note that the prone position is neither suitable, nor advantageous, for all patients, and there are many factors that must be considered in determining the optimal treatment position. At Advanced Radiation Oncology our experienced team of Radiation Oncologist, Nurse, Medical Physicists, Medical Dosimetrist and Radiation Therapists create personalized treatment plans for each patient’s individual needs. We are pleased to offer advanced prone breast radiation therapy as another effective and innovative option for breast cancer patients. To speak with one of our Radiation Oncologists to determine if you are an appropriate candidate for prone breast treatment, call 845.727.0828. 3-D Conformal Radiation Therapy is a method of treating patients who have tumors that are too close to vital organs and other structures for normal radiation therapy. It involves a complex process of creating individualized, 3D digital data sets of a patient’s tumors and normal adjacent anatomy. These data sets are then used to generate 3D computer images that will help in the delivery of highly focused radiation beams that maximize the radiation of tumors while minimizing damage to normal tissue in adjacent organs. The Tomotherapy HI-ART treatment system is a unique, ground-breaking device that is currently available at Advanced Radiation Oncology. Advanced Radiation Oncology was one of the first radiation oncology centers in New York to offer Tomotherapy and are also the most experienced in the use of Intensity Modulated Radiation Therapy (IMRT) and Image Guided Radiation Therapy (IGRT). This state of the art technology is a form of Intensity Modulated Radiation Therapy (IMRT) which is a clinically superior treatment in many cases due to the ability to minimize radiation to healthy tissues. TomoTherapy combines continuous gantry rotation, continuous couch motion, and ultra-fast multi-leaf collimator (MLC). This technology delivers intensity-modulated radiotherapy (IMRT) over extended treatment fields. TomoTherapy is designed to simplify the treatment process and minimize dose to sensitive healthy structures. The TomoTherapy system uses Image Guided Radiation Therapy (IGRT) by taking a special CT scan just before each treatment. This allows them to verify and adjust the patient’s position as necessary to help ensure that the radiation is precisely directed to the target area. Unlike traditional IMRT, the TomoTherapy system combines IMRT with a helical (or spiral) delivery pattern to deliver radiation from 360 degrees in accordance with the prescribed treatment plan. This technology permits the radiation oncologists to offer new advances in treating cancers of the prostate, head and neck, lung, brain, spine, and other previously difficult-to-treat areas. The advantages of TomoTherapy delivery have also been shown in plan comparisons for many clinical indications, head and neck being the best example. A prospective, multi-institutional clinical study supported by the French National Cancer Institute (INCa: Institut National du Cancer) demonstrated that patients with head and neck cancer treated with intensity-modulated radiation therapy (IMRT) showed a significantly better local control rate, cancer-specific survival rate and post-treatment salivary function when treated with TomoHelical™ compared to RapidArc. The study, the first to prospectively compare clinical outcomes across radiation therapy platforms, was part of a voluntary evaluation of IMRT platforms by 14 French centers following a rigorous methodology. This landmark study demonstrates that the technique used to deliver IMRT can have a major impact on patient outcomes. TomoTherapy at Advanced Radiation Oncology is also used to perform stereotactic radiosurgery (SRS) and stereotactic body radiotherapy (SBRT). SRS and SBRT are treatments that deliver high doses of radiation to specific sites with little radiation dose to surrounding tissues. Radiosurgery also offers the patient a non-invasive option when tumors are inside or near critical structures or when surgery may not be a good option. Because of the high doses of radiation patients typically need 3-5 treatments instead of multiple weeks of daily therapy. A patient who is interested in stereotactic radiosurgery (SRS) or stereotactic body radiosurgery (SBRT) will typically go through a few extra steps to determine whether a patient is a good candidate. Radiation Oncologists use image guided radiation treatment, or IGRT, to help deliver radiation therapy to the cancer more accurately each day since tumors can move between treatments due to differences in organ filling or movements while breathing. IGRT involves conformal radiation treatment guided by imaging, such as MVCT or X-rays, taken on the treatment table just before the patient is given the radiation treatment. All patients first undergo a CT Scan as part of the planning process. The imaging information from the CT Scan is then transmitted to a computer in the treatment room to allow Radiation Oncologists to compare the earlier image with the images taken just before treatment. During IGRT, doctors compare these images to see if the treatment needs to be adjusted. This allows the Radiation Oncologists to better target the cancer while avoiding nearby healthy tissue. IGRT has an important role in the treatment of cancer since our anatomy can move on a daily basis depending on the anatomic site of treatment our TomoTherapy is equipped with MVCT technology that enables a CT Scan to be taken to verify positioning prior to radiation delivery. Prostate seed implantation is a minimally invasive procedure for treating prostate cancer in which radioactive seeds are placed in the prostate gland to target cancer cells while maximizing the preservation of healthy tissue. This outpatient procedure requires general anesthesia and takes only a few hours. Most patients return to normal activities within two to three days. Our doctors are experts in treating prostate cancer patients using prostate seed implantation, having pioneered its use over a decade ago. Dr. Gerstley has been performing this procedure since 1995. Prostate seed implantation is not for everyone. The size of the prostate is also an important factor. As a general rule, patients with prostate glands >60cc are at increased risk for pelvic arch obstruction and poor dose distribution. Androgen deprivation (hormone therapy) can be used to shrink large prostates for several months to allow an optimal seed implant. Patients who previously have had a vigorous transrectal resection of the prostate (TURP) for benign prostatic hypertrophy may not be ideal candidates for this implant procedure. Higher rates of urinary complications have been reported for these subset of patients. The first step in the process is an outpatient consultation with a radiation oncologist. The Radiation Oncologist will advise on the implant option based on the patient’s PSA, Gleason score, tumor stage, and other factors. The second step is a planning CT Scan. Once the prostate is visualized, the radiation oncologist determines where the seeds should be placed. Through the use of a treatment planning computer, a series of “dose maps” called isodose curves are generated. The goal is to deliver a dose to the prostate. The seeds are “peripherally loaded” to minimize the dose to the centrally located urethra. This will minimize the risk of urinary side effects. The third step is the implant procedure. This is performed in the operating room under either general or spinal anesthesia. Under transrectal ultrasound guidance, the prostate is implanted through the perineum with needles loaded with radioactive seeds. Fluoroscopy confirms the seed placement into prostate. Immediately after the procedure, the patient is monitored for several hours. Typically, the patient is discharged to go home on the same day. The outcome of implantation is highly operator dependent. As such, it is important for the radiation oncologist to be experienced and proficient with this procedure. Our Radiation Oncologists are among the most experienced and has been instrumental in pioneering this treatment option. A common misconception among prospective patients is that prostate implantation has fewer side effects than external beam radiation therapy. This indeed is a misconception. Nearly all patients suffer from some urethritis. Urinary retention requiring a temporary catheter occurs in 5% of the patients. Brachytherapy is the placement of radioactive sources in or just next to a tumor. During brachytherapy, the radioactive sources are left in place temporarily. To position the sources accurately, special catheters or applicators are used. 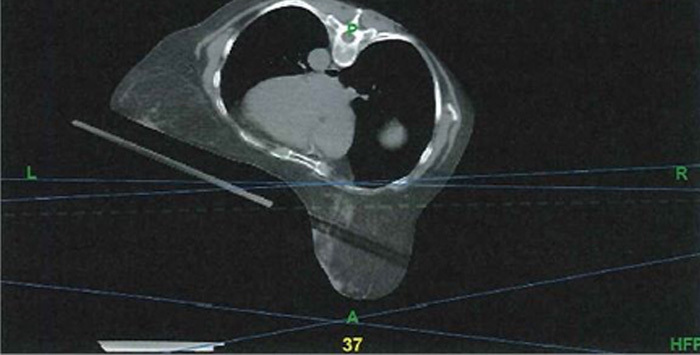 With intracavitary treatment, the radioactive sources are put into a space near where the tumor is located. With interstitial treatment, the radioactive sources are put directly into the tissues. HDR brachytherapy is useful in the treatment of gynecological cancers. Devices called high-dose-rate (HDR) remote afterloading machines allow radiation oncologists to complete brachytherapy quickly, in about 10 to 20 minutes. Powerful radioactive sources travel through small tubes called catheters to the tumor for the amount of time prescribed by your radiation oncologist. You may be able to go home shortly after the procedure. Depending on the area treated, you may receive several treatments over a number of days or weeks.